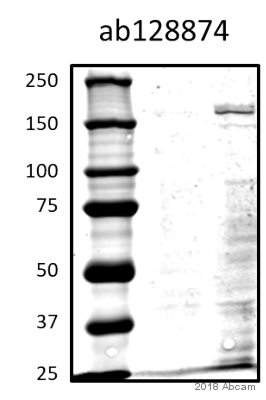 Knockout Tested Rabbit recombinant monoclonal Brd4 antibody [EPR5150(2)]. Validated in WB, IP, IHC, Flow Cyt, ICC/IF and tested in Mouse, Rat, Human. Cited in 36 publication(s). WB: HeLa, Caco-2, TT, RAW 264.7 and NIH/3T3 cell lysates. Wild-type HAP1 lysate. ICC/IF: HeLa and HepG2 cells. IHC-P: Human colon carcinoma and brain tissue. Flow Cyt: SW480 cells. IP: HEK-239 cell lysate. Our Abpromise guarantee covers the use of ab128874 in the following tested applications. WB 1/200 - 1/1000. Detects a band of approximately 152 kDa (predicted molecular weight: 152 kDa). Lanes 1 - 4: Merged signal (red and green). Green - ab128874 observed at 150 kDa. Red - loading control, ab8245, observed at 37 kDa. ab128874 was shown to recognize Brd4 when Brd4 knockout samples were used, along with additional cross-reactive bands. Wild-type and Brd4 knockout samples were subjected to SDS-PAGE. ab128874 and ab8245 (loading control to GAPDH) were diluted at 1/1000 and 1/10 000 respectively and incubated overnight at 4°C. Blots were developed with Goat anti-Rabbit IgG H&L (IRDye® 800CW) preadsorbed (ab216773) and Goat anti-Mouse IgG H&L (IRDye® 680RD) preadsorbed (ab216776) secondary antibodies at 1/10000 dilution for 1 hour at room temperature before imaging. Unpurified ab128874 (1/500) staining Brd4 in HeLa (Human epithelial cell line from cervix adenocarcinoma) cells (green). Cells were fixed in paraformaldehyde, permeabilized in 0.5% Triton X100/PBS and counterstained with DAPI in order to highlight the nucleus (red). For further experimental details please refer to Abreview. Unpurified ab128874 at 1/100 dilution staining Brd4 in human colon carcinoma tissue by Immunohistochemistry. Flow cytometry analysis of SW480 (Human colorectal adenocarcinoma epithelial cell) cells labeling Brd4 (red) with purified ab128874 at a 1/50 dilution (10 µg/mL). Cells were fixed with 80% methanol and permeabilized with 0.1% Tween-20. A goat anti rabbit IgG (Alexa Fluor®488) (ab150077) was used as the secondary antibody at a 1/2000 dilution. Black - Rabbit monoclonal IgG (Black) (ab172730). Blue (unlabeled control) - Cell without incubation with primary antibody and secondary antibody (Blue). ab128874 at 1000 µg immunoprecipitating Brd4 in HEK-293 (Human epithelial cell line from embryonic kidney) whole cell lysate. Sample was incubated with unpurified primary antibody (50 mM Tris dilution buffer) and protein G for 16 hours at 4°C. For western blotting, ab131366 was used as the secondary antibody at 1/10,000 dilution. Immunocytochemistry/Immunofluorescence analysis of HepG2 (Human liver cell line) cells labeling Brd4 with purified ab128874 at 1/100 (Panel A). Cells were fixed with 4% paraformaldehyde and permeabilized with 0.1% Triton X-100. 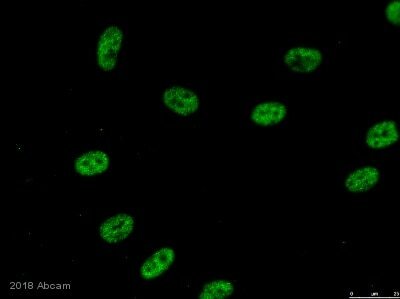 An Alexa Fluor® 488-conjugated goat anti-rabbit IgG (1/200) was used as the secondary antibody. DAPI (blue) was used as the nuclear counterstain(Panel B). Immunohistochemistry (Formalin/PFA-fixed paraffin-embedded sections) analysis of human brain tissue labeling Brd4 with purified ab128874 at 1/200. Heat mediated antigen retrieval was performed using Tris/EDTA buffer pH 9. An undiluted Goat Anti-Rabbit IgG H&L (HRP) was used as the secondary antibody at. Counterstained with hematoxylin. Publishing research using ab128874? Please let us know so that we can cite the reference in this datasheet.